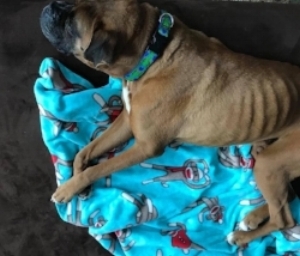 A donation has been made in honor of Rocky to Carolina Boxer Rescue. Lucy - CBR Alum 12/23/18- "The queen has left the building... she had fought her disease as long as that body would let her... she waited for her boy to come home before she passed.... see you at the rainbow bridge my love...#lucyhaspassed🌲❤️"
Diamond - CBR Foster 12/19/18- We are so sorry to let you know that DIAMOND the sweet hospice foster we took several weeks ago with known lymphoma has crossed the bridge.....this holiday season we ask all our adopters to search your hearts....please be with your pets at ALL stages of their life’s journey.....not just for the fun or easy parts.....love to the special foster home that treasured Diamond in her last life stage.....💔run free DIAMOND! Captain - CBR Alum 11/13/18 - Please join us in sending condolences to the family of CBR alum CAPTAIN....He crossed the bridge yesterday after a valiant fight with lung cancer....RUN FREE HANDSOME....you were deeply loved by many. Winnie - CBR Foster 11/15/18 - Run Free Foster Winnie...... no more cancer, no more surgeries.... no more pain. We always worried that your aggressive cancer could spread... and start to impact your mental well being and the safety of those around you. It’s difficult to know that no matter what we did... your cancer was too far gone to save you. Across the rainbow bridge... you have found the peace you needed. Daisy - CBR Foster 11/14/18 - CBR Foster Daisy has crossed the bridge. She had numerous health issues. She was just all used up as a breed dog. She had surgery today for a large mass where they found an enlarged kidney... she had been sick since arriving in foster care. We are so glad she had some good days with us. Owen - CBR Alum 11/7/18 - Please join us in sending condolences to his family....run free baby...you were sooooo loved! We lost our sweet Owen, adopted in 2011 from CBR. He's running in Heaven with granddog Traveller now. My sweetest boy is at the Rainbow Bridge. Trying to keep it together today but struggling. My hunka love is running free now, with all of our special pets. 💔 Please join the entire CBR volunteer family in sending condolences to CBR Director Teresa for her loss. Maggie 10/26/18 - To our friend Mike whose loved girl crossed the Rainbow Bridge. Our condolences Mike. We will always remember Maggie with love and laughter. Ruby - CBR Alum 10/30/18 - Please join us in sending Anna and Jason our condolences as CBR alum RUBY has crossed the bridge. 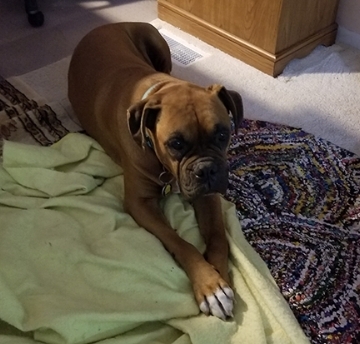 Nyla - CBR Alum 10/28/18 - CBR lost another alum today. Dawn Weber adopted Nyla in 2006. She was fostered by Natalie Rene Cook. Nyla crossed the Bridge today after a wonderful life. Please keep Dawn Weber in your prayers as Nyla was her ride and die dog. Gunnar - CBR Foster 10/28/18 - CBR Alum Gunnar took his last breath in her arms at 1 am this morning. His family did not have him long as his young life was taken so quickly Here is a picture of him. He sure was a handsome boy and so young. Kelly and her family sure were a blessing to Gunnar. Regina - CBR Foster 10/20/18 - It is with great sadness that I share that CBR foster Regina passed away peacefully at home in her sleep last night. She was my first foster and was well loved—she will always hold a special place in my heart. I am thankful that I had that opportunity to have this sweet, wonderful little soul pass through my life—she brightened my day every time I walked through the door. Run free, Regina. Lola 10/20/18 - The lovely LOLA BELLE passed this week... she was head snuggler at her house for 7+ years... please join us in sending condolences to her loving family. King - 10/18 - King was my Mom's world. He was a very special boxer. Everyone that met him fell in love him. He could always give you a sense of comfort when you were sad or sick that no one else could because he just knew. I know he is watching over us everyday and I know he is still with us. I just want my Mom to know that her boy loves her and he always will and he is still with her everyday. Missy Poo Poo - CBR Alum 10/8/18 - Our sassy girl is gone. Missy has had a couple seizures over the last couple months but tonight she started clustering. We were very blessed that she felt good until this evening and will miss her terribly. Fergus - CBR Foster 10/13/18 - Fergus took his last breath today. I cannot form any additional thoughts or words right now. All I know... is we loved him. He loved us. His life was not nearly long enough... but what he had, was as complete as possible. Crushed. 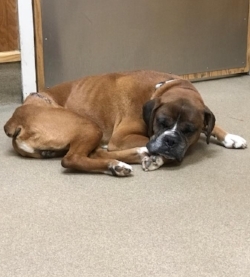 Bosley - CBR alum 10/10/18 - We adopted Bosley from CBR about 7 years ago, as much as it ripped my heart in two, we had to help him cross over the rainbow bridge today. He was the best boy ever! Thank you so much to CBR for taking him into the rescue and his foster mom Theresa Reid for letting him become a part of my family. We miss him terribly already. Chance - CBR alumn 10/18 - Our daughter has an Italian greyhound. When she visits us Chance loves the little guy. 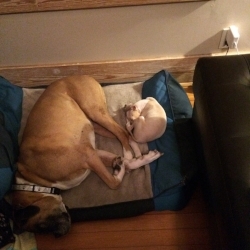 As you can see in the second photo he would share his bed. Our son has a whippet and chance loved him also. He really did become more sociable than we could have imagined. Dually - CBR alum 10/3/18 - I lost my best friend today. My daily companion to pick up Starbucks, my Lifetime movie partner, my front seat car riding buddy that loved the beach, the mountains, the park and simply riding around the neighborhood, my welcome home every time I got back from work, my chicken sharing pal and my king size bed partner. Dually was a perfect fit for me four years ago from Carolina Boxer Rescue after losing my last boxer, Camo, suddenly during a random Saturday night. Dually brought joy back into my life, opened my heart back up for love and allowed me to have another relationship that was built on trust and humbleness. He was everything to me and I will cherish every moment I got to spend with him. Thank you Carolina Boxer Rescue for picking him out for me and giving me four years of unconditional love. I lost my best friend today. Mona - CBR alumn 9/28/18- Our sweet girl crossed the rainbow bridge this afternoon. Poor baby. We have loved her for 5 months and she touched my heart deeply! She had such a great 2 weeks after draining her belly. She played, ran around, jumped from one side of the room to the couch like Mack, had more wiggle in her nub than ever before. Thank you all so much for allowing us to give her love in her last months of life. She will be missed so much by us all and especially her Mack! We love CBR! It is with a heavy heart that I write this ...our beloved Tucker passed away this morning. The doctor said he was doing fine had just come in from outside when he collapsed. They performed CPR but he was gone. They think it was a blood clot to his lungs. Yesterday the doctor had said We might be able to bring him home soon his blood count had improved. We had him such a short time but we loved him so. He was a pure delight. We are thankful for the short time we had him! Sadly, we lost our beloved foster failure, Addie, this week. We took her in as a foster about 9 years ago and just couldn't think of letting her go. She was the most loving, sweet, and gentle Boxer we ever could have been blessed with, and she shared her Boxer love and kisses with us for an amazing 9 years. Right now we just can't believe that she's gone, and we will miss her terribly. She will forever be in our hearts and memories. We may have given Addie her forever home, but she gave us so much more. Thank you to Atlanta Boxer Rescue for bringing Addie to us. And, thank you to all of Boxer rescue groups for all they do. Jeffrey was loved by all of us! We were lucky to have to have him! He wiggled into our lives and into our bed at night. You were our pillow, our buddy, our walking pal. His passing was very fast and we are great full he didn’t suffer long.We had you for short time but you Were a joy for us! Thank you CBR for letting us be apart of his life. Enzo passed away early this morning in his sleep. We almost had him for four years. He did the cutest boxer wiggle yesterday so I'm happy we got to see that one last time. We will miss him so much. Our condolence to Enzo's family. Rest easy, we hope you have found some comfort and peace. Please join us in sending condolences to the family of CBR alum SUKI who has crossed the bridge after a long and courageous battle with megaesophagus among other health issues...they fostered and adopted her and are long time CBR volunteers....run free sweet girl. Sweet CBR alumni Maximus had the most spoiled life. Cancer took him way to soon and his girls certainly be missing him. So thankful that he found the truly the best family ever and was able to feel true love. Toni & Noelle will miss you dearly. Rest easy little man, we hope you have found some comfort and peace. It’s too soon you sweet, sweet girl. CBR alumnus Paulina was laid to rest today after a very long day yesterday determining why she had not been eating. US determined masses in several locations, including pancreas, gallbladder and liver. She joined her fur sister Heide at the Rainbow Bridge. Run free, sweet girl. He woke us up at about 5am and was shaking. It appears by the amount of slobber on his bed he had been having a seizure for some time. We drove him to the emergency vet were they could not get the seizure under control and he could not reset. We made the heartbreaking decision to stop the seizure for him and we are struggling with it as the day goes on. We loved him so much and while he had a rough start his last 3 years were Christmas every day. We are so thankful that we had him in our lives and that this organization exists. He was our first nub tail and we have been spoiled by his calmness and gentleness and love of a nap. My heart is broken. I had to say goodbye to Oliver today. His cancer returned as an internal mass and he was struggling to breathe. Even though he was in pain, his nub didn't stop wiggling. Thank you for giving me the gift of being his mom. We adopted Abe on October 13, 2006 and he passed quietly at home this afternoon. We are very grateful to Carolina Boxer Rescue, Bo and Amber who fostered him, and all the friends who enjoyed his high energy shenanigans over the years. Special thanks to Noah’s Ark Veterinary Hospital who treated him with special care. He was an incredible dog and will be missed. With our daily 1.55 mile walk (sometimes twice a day), I estimate that we covered over 6,500 miles together. So if you see me starting to gain weight, you will know why! Life moves on…Abe will always hold a special place in our family. Run free sweet Champ. You will be missed. Run free sweet Phoebe. This is the Gaston girl with the tumors I pulled from the Gaston shelter about 6 weeks ago. She had several ER stays and numerous blood transfusions but her little body couldn't overcome the cancer. She was so loved by her incredible foster mom Lindsay and her wonderful family. They showered her with love and Lindsay spent many sleepless nights laying with her while she was so ill. Thank you Carolina Boxer Rescue for trying everything possible to save sweet Phoebe. Our hearts are broken but most especially her foster family's. Please keep the Heikel family in your thoughts and prayers as they are devastated right now. As swiftly as she entered our lives and Hearts, She swiftly found comfort & peace. And she takes with her a piece of our hearts. She was loved beyond measure. Thank you to our amazing foster families that love our dogs! She came from a shelter in Wilmington, I believe...I was her foster mom starting in 2013 and when no adopters stepped up after a year we decided to adopt her for my husband’s birthday in June 2014. She had some major issues, but we worked through them and she has been a very special part of our family for 5 years...especially for our now 3 year old son who just adores her...she was the best big sister to him!! We are heartbroken but glad we could give her a loving home so she could finally feel at peace in her later years. Roxie loved going to the beach, bike rides, car rides, and long walks in the evening...but most of all she loved going to the mountains and hiking the trails with us! We are planning to spread her ashes at our family mountain house, where she was always at her happiest. We’re not ready to bring another fur baby into our pack yet, but will certainly let y’all know when we are...Roxie was our family’s third boxer...CBR alum China, who belonged to my sister Anna, crossed the rainbow bridge this past Christmas after a 6 month battle with cancer. When CBR saw you, we never hesitated once when asked to take you into our care. there has been not a single thing that CBR and your fans haven't done for you. we all banned together and got you the best care you could have ever received. we got you your MRI, your surgery, your wheelchair, the best therapist the world could ever ask for that worked around the clock with you, a team of vets who cared for you deeply. we even had people send you gifts, who never met you, and loved you anyway. we did all we could, but it just wasn't enough to help you walk again. looking at you the past couple weeks, i knew you had given up. i knew you were tired. you couldn't take a step, with every drag of your rear end i had to coax you to get out the door to even go outside. you were so tired, that you laid in the same spot for hours, laying in your own urine and feces without a care in the world that it was there. you were too tired to even stand up and pee on your own. you were tired. and i don't blame you. we worked so hard. we tried so hard. i was tired for you. please know, that i am happy for you now. when your team of therapists and i sat with you as you crossed, we all said "run free sweet boy. run." and i know you are now. you are running free in meadows up at the rainbow bridge. you are happy now. Until we meet again, my friend, please know we all love you.. and we all tried so hard..
We are completely devastated to report that CBR foster BO has crossed the bridge... we knew when we took him in that he would be a hospice kid because of his cardiac issues. We didn’t know it would be so soon. He passed in his loving foster mom’s arms... fly high handsome... we will save more in your honor💔 . Sweet CBR foster Louie passed unexpectedly with a blood clot after surgery. His foster family will certainly be missing him. We are glad that he found us to live out his final days. Luke was the best, made me smile everyday. He loved it when I would lay on the floor with him and give him lots of kisses and hugs. He was the sweetest, loving dog I've ever had. I struggle everyday in not being able to talk to him or love him, feed him and run with him. I know deep down myself and husband gave him the most loving home for 2 yrs that he had ever had. He was such a happy boy. I so dearly miss my Luke, he was my pride an joy. I just wish I could have him back and would do anything to have him back in our home where I can love him to no end. Mommy and daddy will always love you Luke! Gunner's family gave him a wonderful 14 years, and in return he has left his paw print forever on their hearts. A memorial in honor of Amanda Provenzano's co-workers dog.